Overshadowed by the launch of the new stainless steel Daytona with the Cerachrom bezel, the overhauled Air-King also made its debut at this year’s Baselworld. Here we take a look at five top facts about Rolex’s new aviation inspired timepiece. Rolex Air-King ref. 116900 comes in stainless steel. In 1945, Hans Wilsdorf and Rolex launched the “Air” series of watches to honor the British Royal Air Force (RAF) pilots during World War II. Among the tribute Rolex watches were the Air-Lion, Air-Giant, Air-Tiger, and the Air-King timepieces. The 34mm Air-King was a straightforward, stainless steel, time-only Rolex that was positioned as the brand’s entry-level timepiece. The Air-King continued to be a part of Rolex’s catalog with several models over the course of its history, thus, is one of the brand’s oldest collections still in existence today. In 1945, Hans Wilsdorf and Rolex launched the “Air” series. 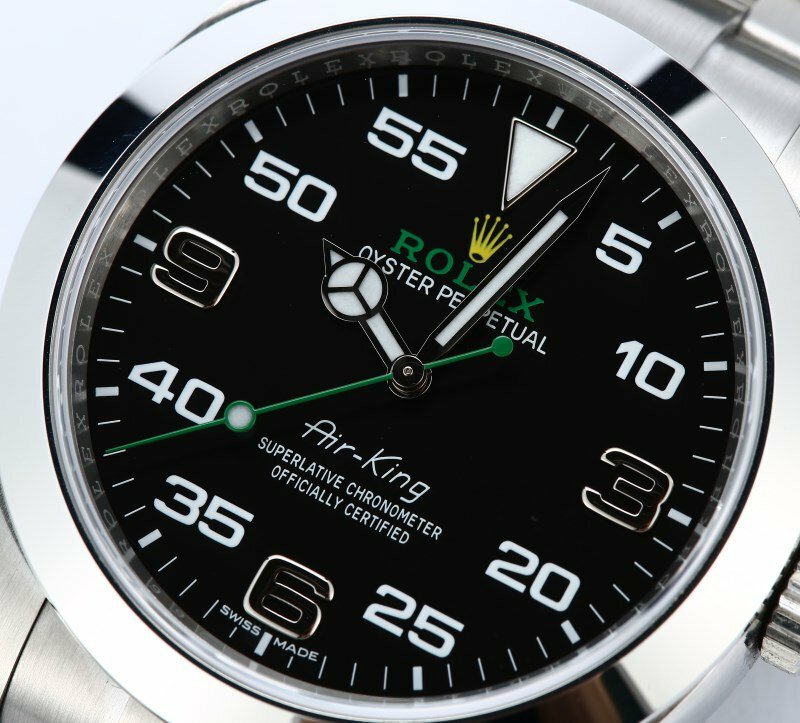 The production of the Air-King was discontinued in 2014, initially replaced by the Rolex Oyster Perpetual as an entry-level option. Rolex however, decided to bring it back and presented a revamped version of the Air-King at the Baselworld 2016 fair — the Air-King ref. 116900. 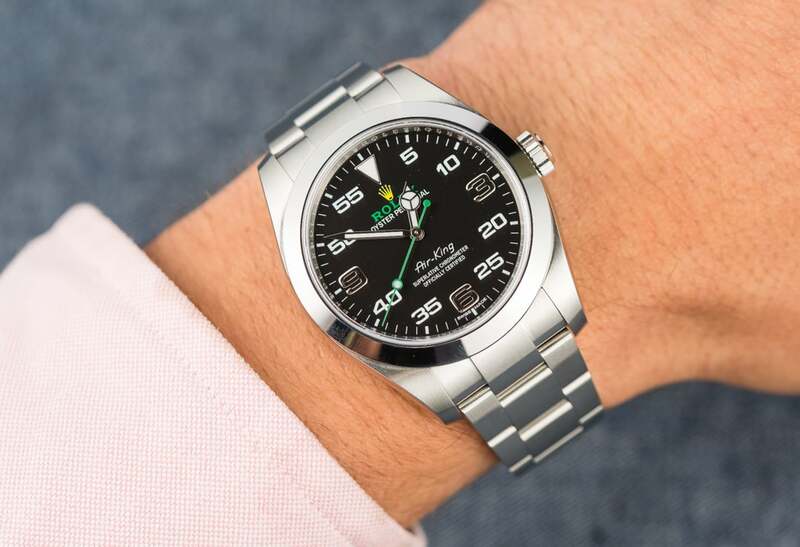 Although still an affordable option within Rolex’s product offering, the Air-King is now positioned more so as an aviation inspired watch, reinforcing its roots. 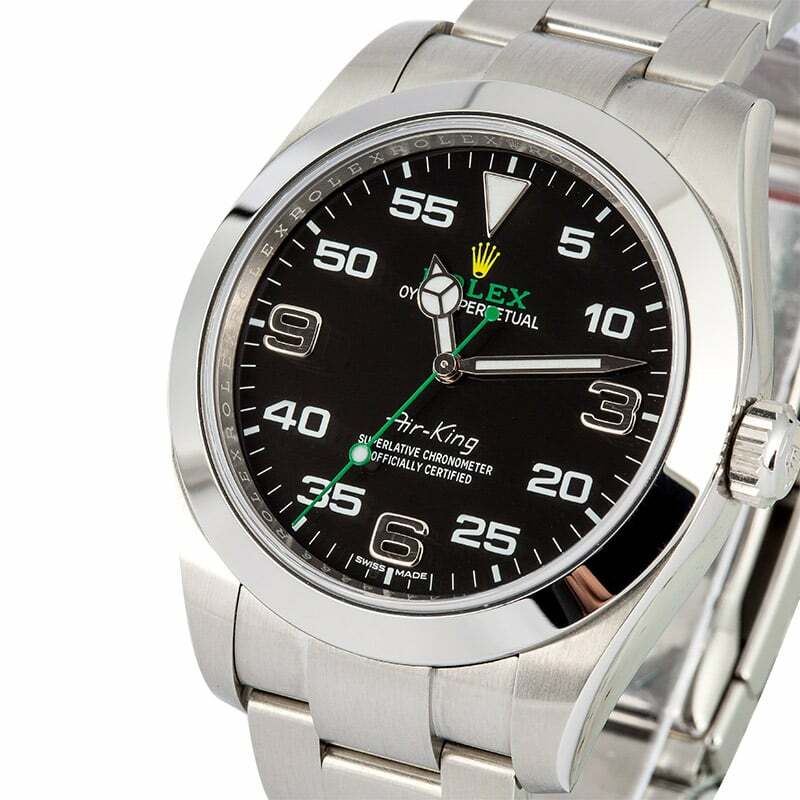 The Rolex Air-King was discontinued in 2014. Among the number of new design details of the new Air-King ref. 116900, one of the most significant changes is its size. 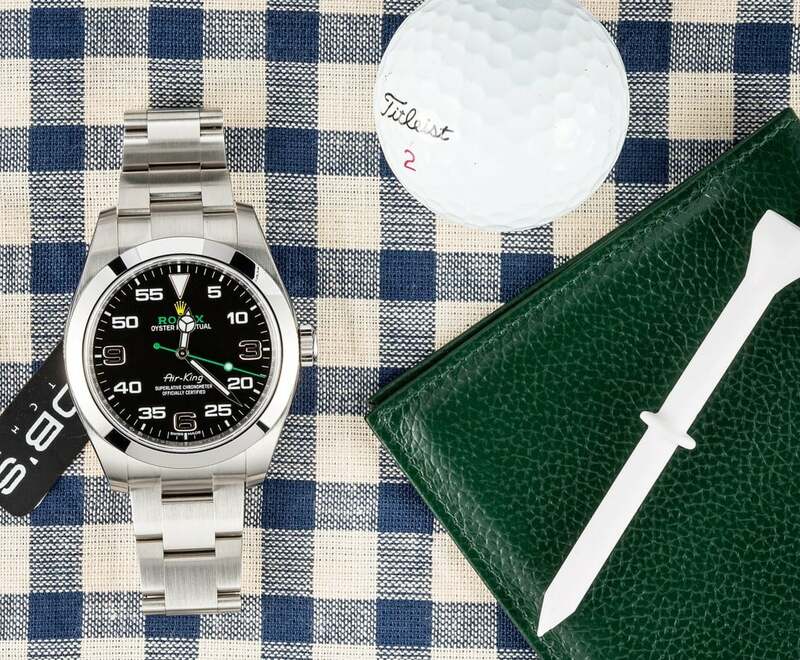 Originally sporting a 34mm case, the new Rolex Air-King now boasts a 40mm stainless steel Oyster case, thereby injecting a much more sporty and modern appeal to the watch. The case is outfitted with the Twinlock screw-down crown for water resistance to 330 feet (100 meters). The matching stainless steel Oyster bracelet not only enhances the look of the luxury sports watch, but also provides extra comfort with the built-in Easylink 5mm extension system. 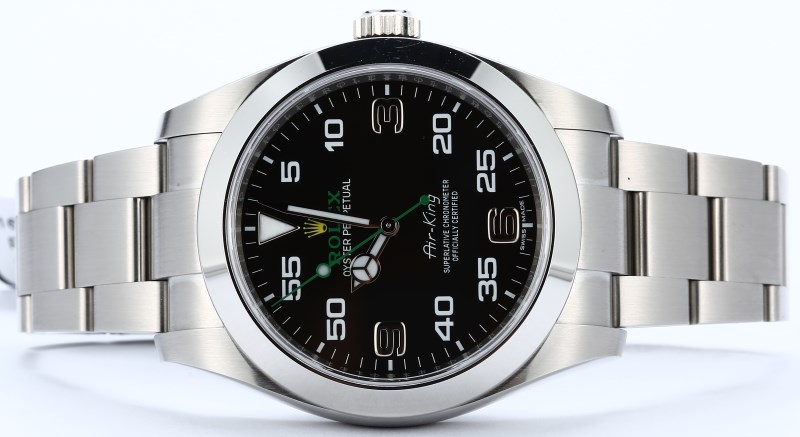 One of the most significant changes Rolex Air-King ref. 116900 is its size. The biggest source of debate among Rolex fans concerning the new ref. 116900 is the design of the dial. Different from past Air-King models where the dials were simple and clean, the new models features a much more dynamic and somewhat busy dial. On the black dial, the characteristic 3, 6, and 9 hour-markers are now joined by minute-markers too. Furthermore, there’s the large luminous triangular index at 12 o’clock and the Mercedes-style hands — both new to the Air-King series. A very interesting design choice is the green and yellow color combination of the Rolex logo and coronet with the matching green seconds hand. 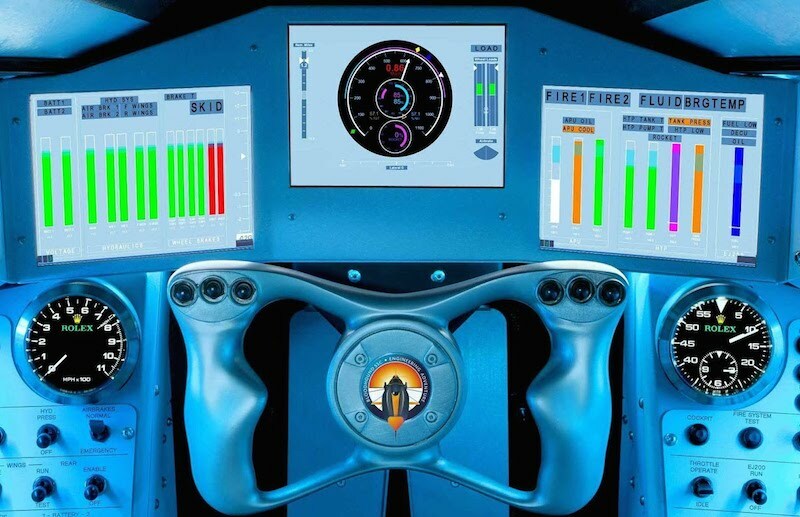 A closer look at the dashboard of the Bloodhound SSC 1000 MPH Car — a supersonic land vehicle that will attempt to break the land speed record in 2017 — reveals where Rolex got at least some of its design inspiration for the dial of the new Air-King. Also new to the collection, the Oyster case of the new Air-King ref. 116900 is equipped with a specialized shield to protect its movement from magnetic fields. Powered by the Rolex Caliber 3131, the automatic movement is also fitted with the paramagnetic blue Parachrom hairspring for additional protection against magnetic fields. The COSC-certified Air-King ref. 116900 offers 48 hours of power reserve and a precision guarantee of +2/-2 seconds per day. The Rolex Air-King ref. 116900 is equipped with a specialized shield to protect its movement from magnetic fields.